Curly does not enjoy spelling and it’s not secret that spelling is her least favorite subject right now. So, I am always looking for ways to help her practice spelling without completely torturing her. 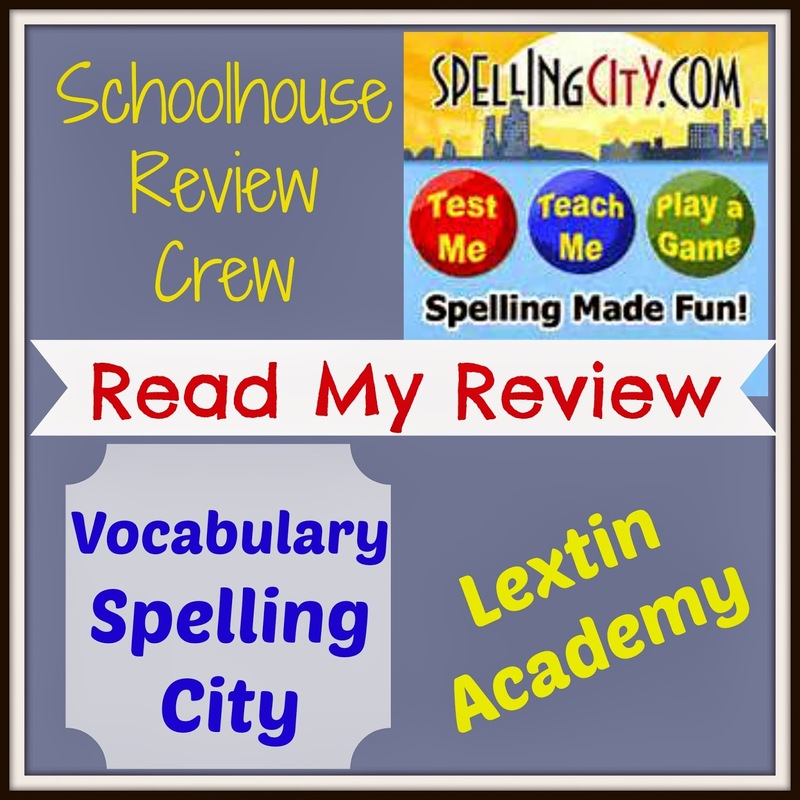 We were excited to have the chance to review VocabularySpellingCity! Curly now gets some spelling practice time on the computer without me! And she doesn’t complain about spelling quite as often! 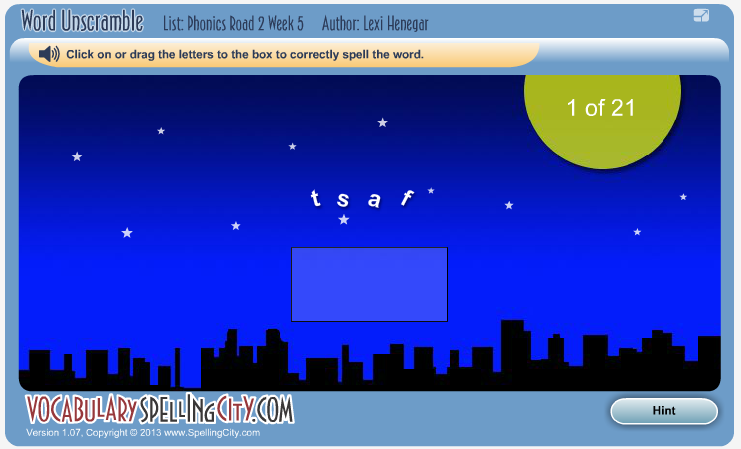 VocabularySpellingCity is an online vocabulary and spelling review for kids from Kindergarten to high school. The program provides word lists or allows the parent or teacher to create spelling and vocabulary word lists based on the student’s current studies or abilities. The program contains audio spelling tests in which the words are repeated to the student for him to type into the program. Sentences and definitions are also included. 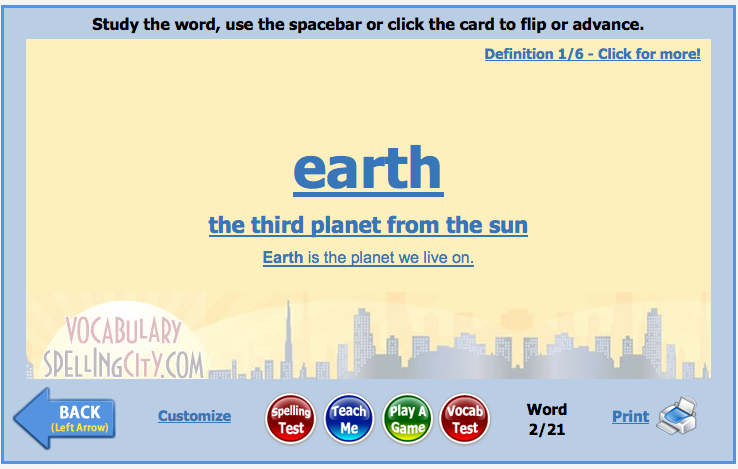 The program also includes multiple games to reinforce the words and give the student practice in a variety of formats. You can purchase a premium membership which allows you access to all the features, games, word lists, as well as the ability to create and save your own word lists for $29.99 per year. This membership allows you to add up to 5 students on one account. 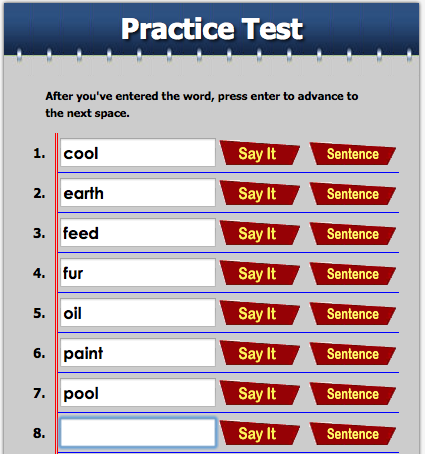 Spelling Test – The student is given each word and a sentence. The child types the word in the space and hits enter to advance to the next word. 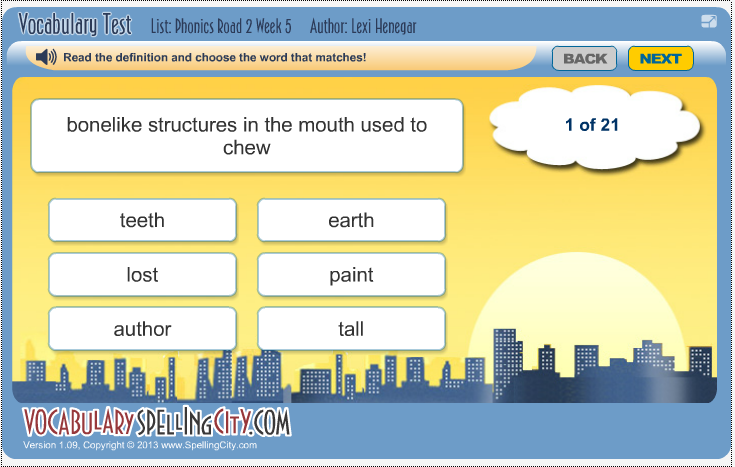 Teach Me – This section reads each word and then spells it out loud to help the student practice. 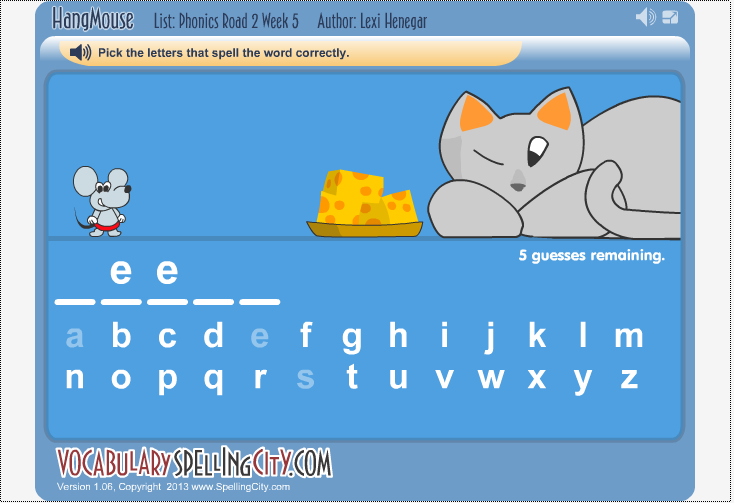 Play a Game – There are multiple games in this section that help the child practice the spelling words. 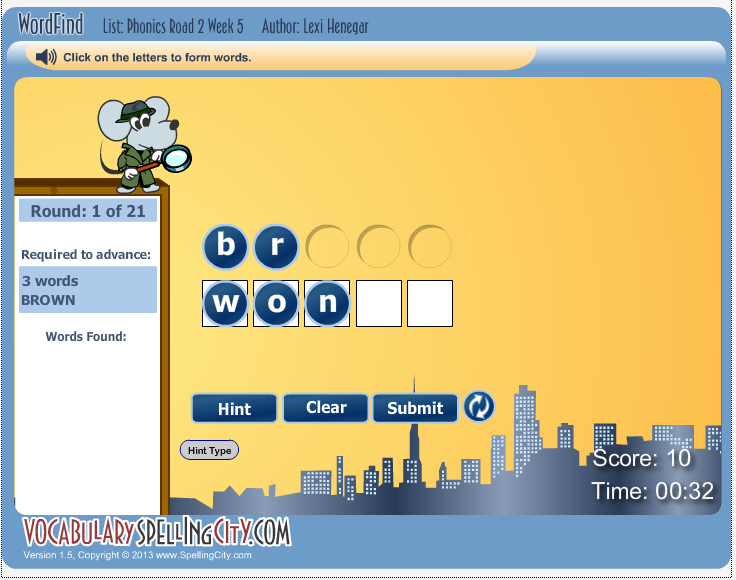 Some of the games are word searches, hang mouse (hangman), and word unscramble. Flash Cards – One side of the card lists the word while the other side lists the definition and a sentence using that word. Vocab Test – The test is multiple choice. A definition is given and the student must choose the correct word for that definition. 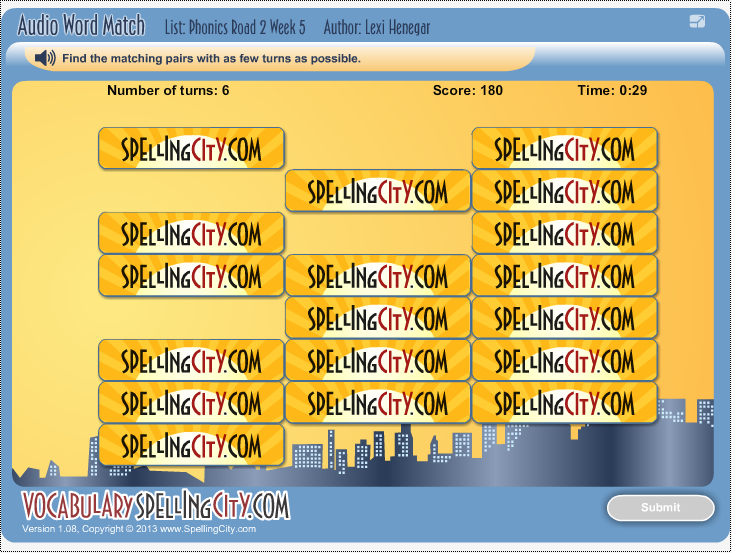 I set up an account for both Tiger and Curly on VocabularySpellingCity. I added spelling lists from Curly’s curriculum and added some of the short CVC words that Tiger can read. I then chose assignments for each word list and made them a list of assignments to complete through the program. 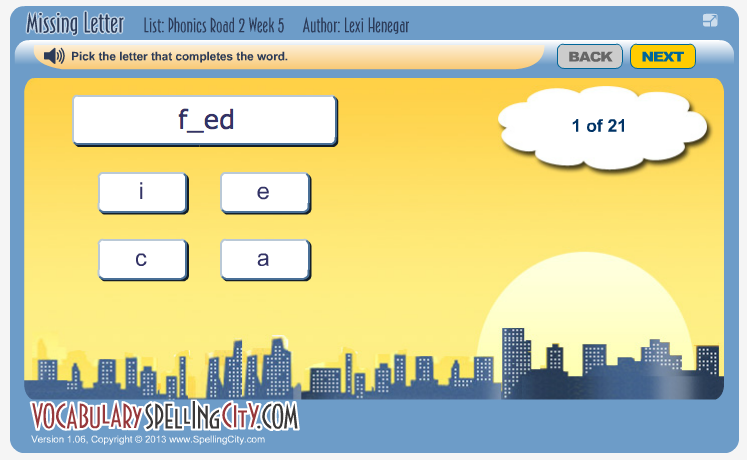 Both of my children were able to work independently and complete their spelling assignments – taking spelling tests, completing vocabulary tests, and playing games to reinforce their spelling words. I was able to track their progress when I logged in as the parent and I could see how well they had done on each test as well as what words they had missed. The program also contains a teacher resource section with videos and lessons about topics in language arts, useful word lists taken from a variety of subjects and topics, and helpful teaching tips. I found that I used the lessons in the Language Arts section with Curly as we watched videos about compound words and contractions to enhance our language arts studies. Nothing! I found the program easy to navigate, easy to use, and the kids found the games to be enjoyable! My kids enjoyed all the games except one: The least favorite game was the Letter Fall game in which the kids had to direct the mouse to catch falling letters in his bucket. My kids were not happy when they caught wrong letters in their bucket! 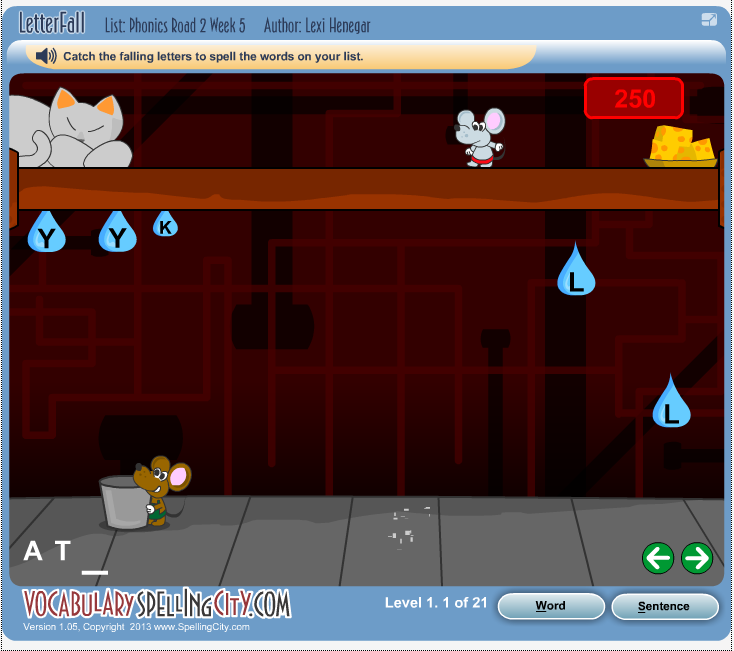 This game was a little tricky for Tiger who was not quite coordinated enough with using the keyboard to move the mouse fast enough to catch the falling water droplets. This would probably be best for older kids – or at least kids who can handle a little bit of failure. Mine cannot!! I loved that I could create specific assignments for each child! I could check off which activities I wanted my children to complete to correspond to each spelling list. In this way, the program was completely independent and I did not have to give any instruction to Tiger or Curly. They were able to log in and see what assignments they should complete. This feature also allowed me to choose which games I felt were most appropriate for each of them – and to make sure they used a wide variety of the different review games for each lesson. My kids loved the games! They looked forward to playing each of them. The hands-down favorite was Hang Mouse where the kids tried to guess the word one letter at a time without choosing too many wrong letters and thus waking the sleeping cat. Curly loved the Word Search game because she loves puzzles. She also enjoyed the challenge of making new words using the letters in her spelling words in the Word Find game. My favorite feature of the program was the ability to create my own word lists and assign certain games as practice for each word list. While the free platform of this program is fun and helpful, I have found the premium membership to be worth the cost to track information, create and save word lists, and assign games and tests for each word list. My kids enjoyed the practice they received with the program and I found that they are slowly remembering to apply their spelling rules. Both Tiger and Curly have performed better on recent spelling tests and I can tell they have improved retention of their spelling words. I have found this program to be a wonderful resource for our family as a means of independent spelling review and practice. What did the Crew think about this product? Read the other Crew reviews!